Ashok Banker is considered one of the finest authors in India who has been credited as the pioneer of Indian Crime fiction in English. His latest book Awaken is a trilogy in fantasy genre with a girl as superhero. Set in India the story looks very promising. Releasing on 1st September, here's a sneak peek into what's in store! Ashok Banker is the internationally acclaimed author of over sixty published books which have sold over three million copies in twenty-one languages and sixty-one countries. He has been credited as the pioneer of Indian crime fiction in English and with launching the genre of mythological retellings, India’s biggest-selling publishing category. As a journalist, he broke front-page news for Times of India, Outlook and The Week. As a screenwriter, he created and wrote India’s first TV series in English, A Mouthful of Sky. Ashok is of Irish-Portuguese-Sri Lankan-Indian parentage, and lived in India for over fifty-one years before migrating permanently to the United States. 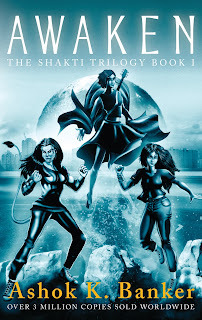 Awaken is the first book in the Shakti Trilogy. The Haters are coming to destroy all life on Earth. It is not a question of if, but when. The Brahmaand has already rung the warning bell and the awakening of the Preservers has begun. Kiara unexpectedly finds her skin covered with golden fur and her sense of smell extraordinarily enhanced; Saumya is suddenly able to go from Ahmedabad to New York in just a step; and Sia’s songs have the power to do things she had never imagined possible. First in the thrilling Shakti Trilogy set in contemporary India, Ashok Banker’s action-packed and brilliantly imagined Awaken introduces our unlikely heroes who must discover and harness their superpowers before they can protect and preserve the Earth from the wrath of a menacing alien invasion.